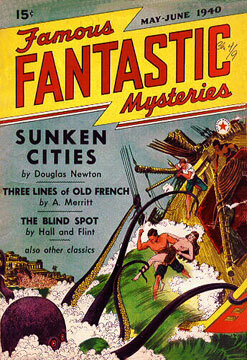 Famous Fantastic Mysteries was not among the first science fiction (sf) titles to appear on the newsstands, but in many ways it was among the most important. It was responsible for introducing an entire generation of authors to an audience that may never have encountered them otherwise. 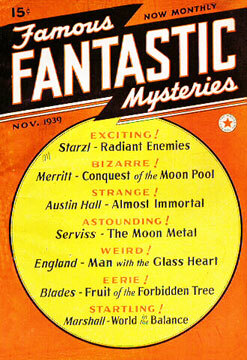 Launched as a reprint magazine in late 1939, Famous Fantastic Mysteries (FFM) was published by the Frank A. Munsey Co. Although twenty-five years after Munsey's death, FFM benefited from the former chief's frequent selection of speculative and science fiction for his flagship titles at the turn of the century, The All-Story and Argosy in particular. FFM's purpose was to reintroduce classic stories from the publisher's expansive list of copyright works (although some original stories did appear). Appropriately enough, the premiere issue carried two stories that had proven the most popular at the time of their original publication: A. Merritt's "The Moon Pool" (1918) and Ray Cummings's "The Girl in the Golden Atom" (1919). Later issues featured a mix of serials, full-length novels, and included several other early Munsey stalwarts such as George Allan England, Ralph Milne Farley, Austin Hall, and Homer Eon Flint. The magazine was edited by Mary Gnaedinger for the entirety of its nearly 15-year run (1939-53). FFM had an uneven printing schedule for most of its existence, alternating between monthly, bi-monthly, and quarterly issuances throughout the 1940s. While the first five issues featured no cover artwork, Virgil Finlay and Frank R. Paul supplied cover illustrations beginning in March 1940. FFM spawned a companion title, Fantastic Novels (also ed. by Gnaedinger), in July 1940, which was intended to feature full-length novels—while FFM was reserved primarily for serials. Fantastic Novels was merged with Famous Fantastic Mysteries in May 1941, but in March 1948, it returned to its own, separate publication. In 1942, the Munsey properties were sold to rival publishing house, Popular Publications. Under new management (but still retaining Gnaedinger), FFM augmented its content. Between 1939 and 1942, only three reprinted stories from non-Munsey titles had appeared in the magazine—they included H.P. Lovecraft's "The Colour Out of Space" (October 1941). After its acquisition by Popular, however, a broad selection of sf appeared—more non-Munsey reprints, original stories, and long out-of-print books representing a variety of genres. Classic "scientific romances," such as Charles B. Stilson's "Polaris of the Snows," ran alongside weird fiction by Lord Dunsany, or mainstream works such as G.K. Chesterton's "The Man Who Was Thursday." 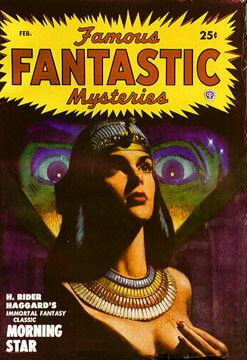 Famous Fantastic Mysteries was published—albeit irregularly—for nearly fifteen years, ending with its June 1953 issue. As a reprint magazine featuring early classics of the sf genre, it introduced a new generation of readers to the scientific romances, lost civilization, and otherworldly love stories of the early 20th century, works that inspired Ray Bradbury, Theodore Sturgeon, Leigh Brackett, and other writers throughout the 1940s, 1950s, and beyond. Gunn, James. Alternate Worlds: The Illustrated History of Science Fiction (Englewood Cliffs, NJ: A&W Visual Library/Prentice Hall, 1975). Sampson, Robert. Yesterday's Faces: A Study of Series Characters in the Early Pulp Magazines, Vol. 2 (Bowling Green, KY: Bowling Green University Popular Press, 1984). Tymn, Marshall B. and Mike Ashley, eds. Science Fiction, Fantasy and Weird Fiction Magazines (Westport, CT: Greenwood Press, 1985).